Hello again everyone! I hope you're all having an awesome weekend! As we are heading towards summer and most of us are imagining seeing some sunshine soon *come on English weather!!! * I thought it would be a good idea to reassess my fake tan situation! Now I must confess I am a total Casper when it comes to natural skin colouring. I really am white as a sheet (I think the more flattering term is 'English Rose. ')Nevertheless, as soon as I feel it's appropriate to wear sandals and short sleeves publicly, I always feel the urge to assess my fake tan products and start applying them! During the winter months I revert back to my pale self, which is good because it gives my skin a break from self tanning chemicals and other nasties, but I always think I look a little more 'alive' shall I say? when I have some colour to my skin, it's just so much more flattering on me! Having pale skin means I burn super easily and therefore I have to wear lots of sunscreen if I don't want to resemble a lobster during the summer months. There is just zero chance of me getting a natural tan, so like lots of women in the same boat, I look to the bottle to help me out! Disclaimer...Im obviously not talking about the alcoholic bottle here, haha! I mean the fake tanning solution! So for any of you who are looking to try fake tan and want my honest opinion, I'm going to talk about three total winning solutions which don't have to break the bank....keep reading if you want to find out more! 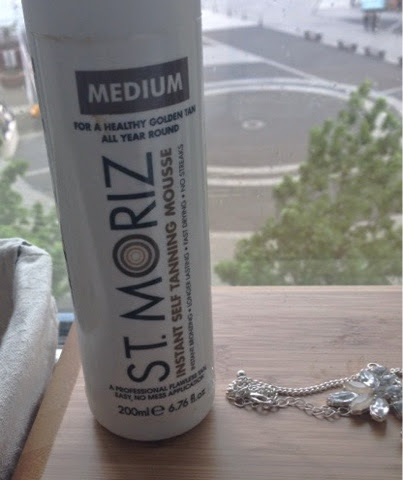 I've Been using this St. Moritz tanning mousse for a few years off and on. I really like how easy and quick to apply it is! obviously, it's a good idea to use a tanning mitt when applying as this will avoid the 'tell tale' sign of a fake tanner-those stained fingers! Haha, we've all been there! By massaging this mousse on in circles I always find a smooth, effortless finish which lasts well and fades gradually. The colour is really buildable too so you can choose how dark you want to go by how many consecutive applications you go for. I personally put this up there with St. Tropez self-tan, it's just not as expensive which is great news! This is one of the best self-tanning solutions on the market, and unfortunately, the price does reflect this. However, these tubes do last a really long time. I've had mine since last summer and it's still going strong! Again, a tanning mitt is a must when applying this fake tan as it will stain your hands otherwise. This product appears very dark from the tube and can look a little scarily dark when you first sweep it over your skin, but once you massage it in the colour seems to appear less intense. Basically, i'm trying to say that I never went dark brown or bright orange from one application and remember, I am on the far end of the 'pale skin' spectrum! St. Tropez lasts well too and best of all, it doesn't have that horrible 'fake tan' smell either! It smells lovely actually and feels really nourishing on my skin. This is probably my favourite self-tanning product to date, it just ticks all of the boxes, lasts well, fades evenly, builds into a believable tan, smells amazing....I could go on, but I think you get the picture! haha! 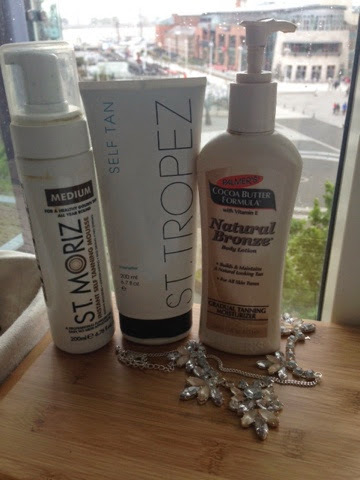 This has definitely become my go-to formula for a quick fake tan with no mess! I like Palmers because I associate any of their products with pampered skin. I just love their body butters and I especially loved using their pregnancy range when I was expecting. I have built up a trust relationship with Palmers which, I know is all too emotional, haha! I started using their fake tan a couple of years ago and I always come back to it. It's not the best of the market but I really do love the colour of the tan I get with this bottle. It's very natural and provided you exfoliate properly before applying, this tan will go on very evenly and last well too. It's great to take on holiday to top up a natural tan or to give some colour to naturally pale skin, a great big thumbs up from me! So as always, these three have been tried and tested by me and I would recommend them all to my readers. 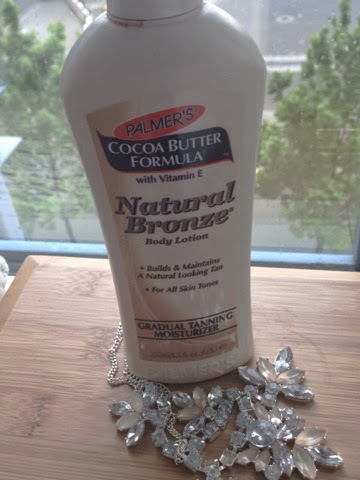 If you want a cheap fix, or maybe you're new to fake-tanning, I would recommend you start with Palmers as it's inexpensive and quite forgiving too! But if you are looking for a better quality universally acclaimed fake tan, it's got to be St. Tropez without a doubt!